A 38 North exclusive with analysis by Frank V. Pabian and Jack Liu. 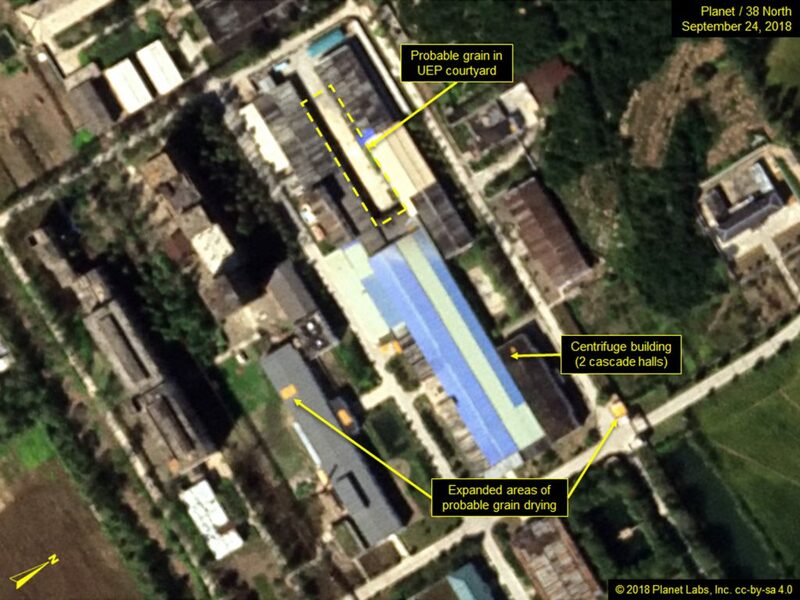 Recent commercial satellite imagery of North Korea’s Yongbyon Nuclear Scientific Research Center indicates no significant changes in the fissile material production areas since our last report. Dredging activities near the 5 MWe reactor’s secondary cooling system continue, and minimal movements of vehicles and equipment have taken place near the 5 MWe reactor and Experimental Light Water Reactor (ELWR). 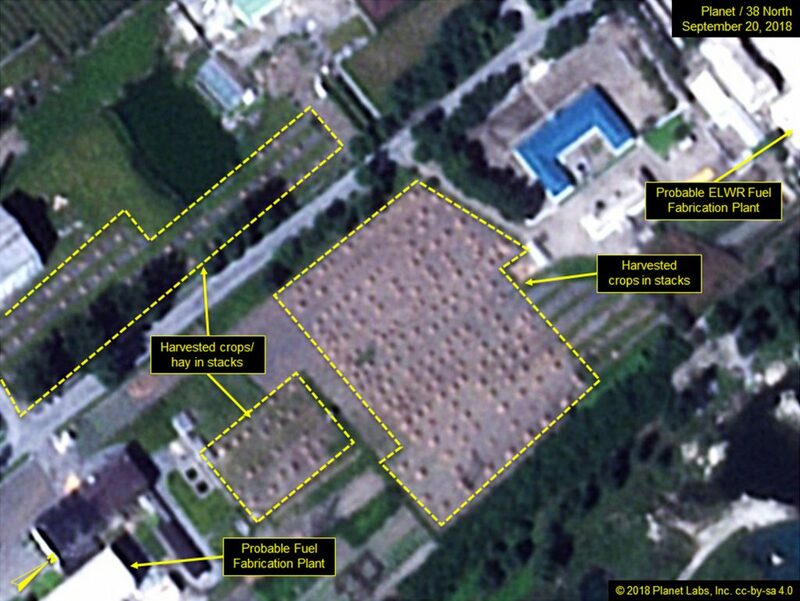 Additionally, harvest related activities, such as drying and aggregating various crops that are grown onsite, have increased throughout the Yongbyon complex. 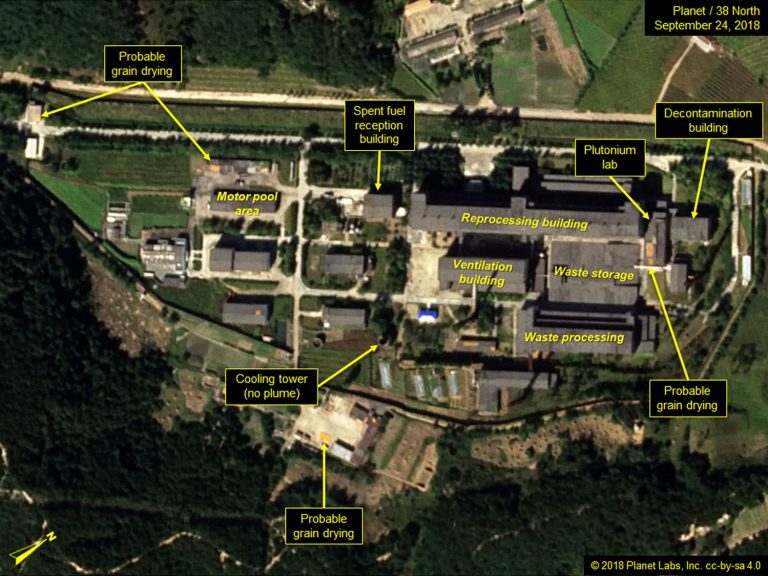 During the recent summit, North Korea expressed in the joint declaration, “‘the will to continue taking further steps like permanent dismantlement’ of its main Yongbyon nuclear facility, but only if the United States takes ‘corresponding steps’ that are based on Trump’s agreement with Kim at their June summit.” Permanently shutting down Yongbyon and allowing inspections would provide the first substantive step towards denuclearization. 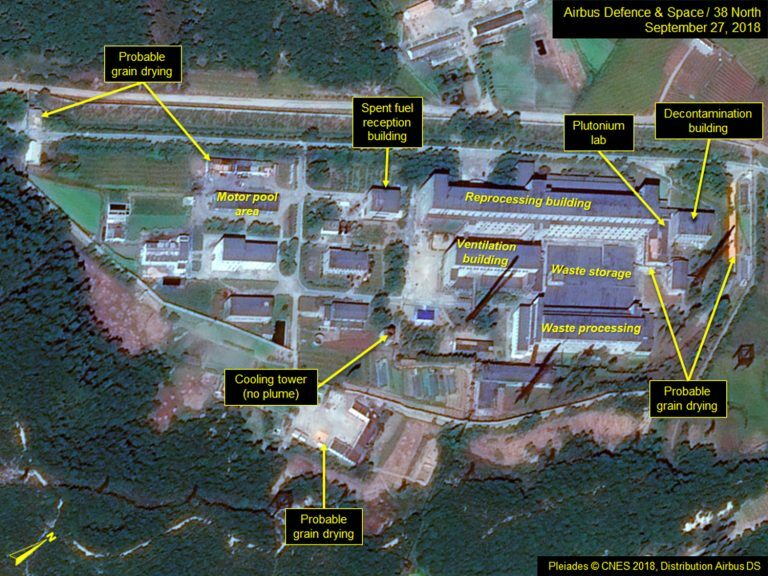 The verifiable dismantlement of its reactors and reprocessing facility would cut off the only known means for producing plutonium in North Korea. 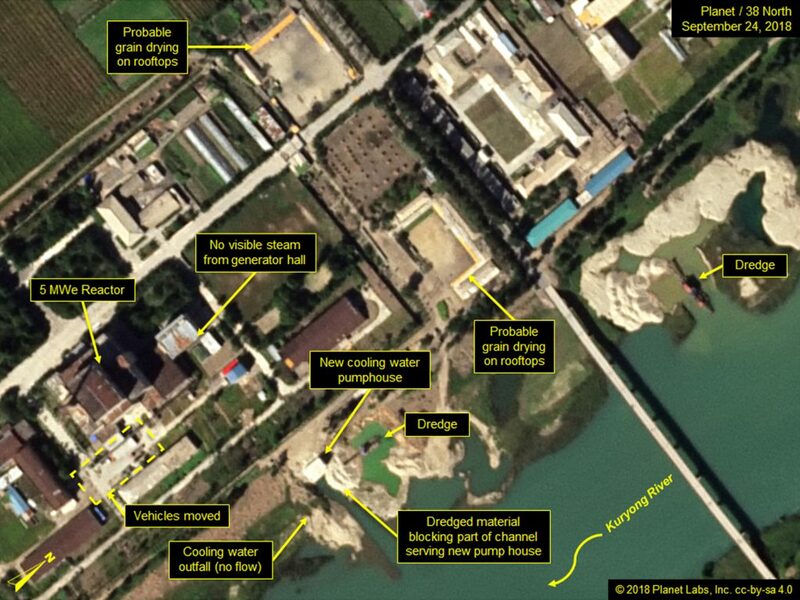 The dismantlement of Yongbyon’s Uranium Enrichment Plant would reduce, but not necessarily end the North’s capability to produce highly enriched uranium given the likelihood that other plants exist offsite. 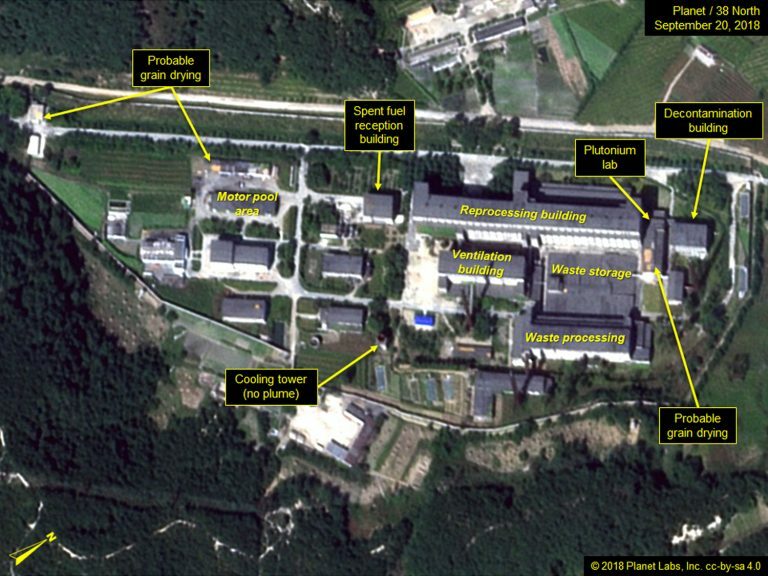 Yongbyon’s Isotope Production Laboratory suspected of being able to produce tritium and/or lithium deuteride needed for thermonuclear weapons would also be shut down. Finally, dismantlement would include the North’s only identified nuclear fuel cycle facilities likely to be capable of fabricating reactor fuel from both natural and low-enriched uranium. 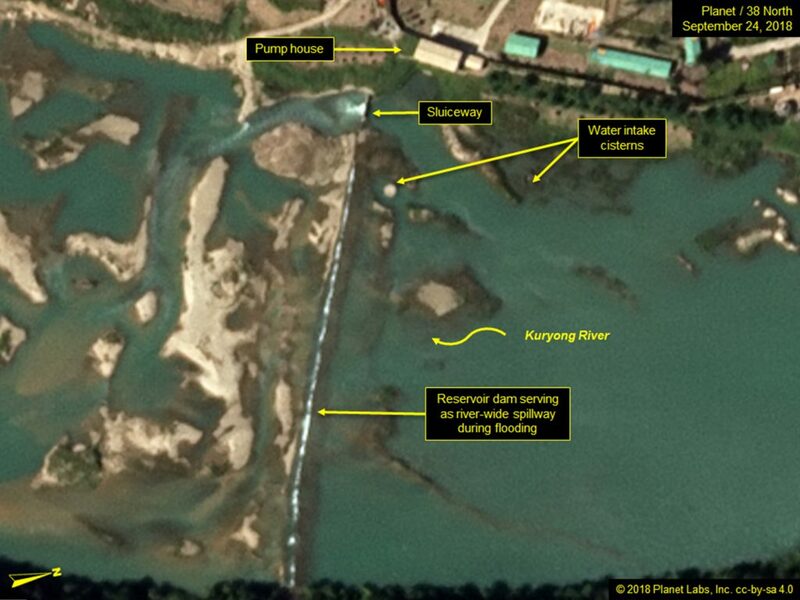 Commercial satellite imagery from September 20, 24 and 27 (of varying resolutions: ~80 to ~50 cm) indicates ongoing dredging of the Kuryong River adjacent to the new pump house associated with 5 MWe reactor’s secondary cooling system. Dredged material continues to block a large portion of the river channel serving the new pump house, suggesting that the modified cooling system remains inoperative and is still incomplete. Moreover, at most, only a minor flow could be detected (on the latter two images) from the pre-existing cooling water outfall pipe, which is located just south of the new pump house. 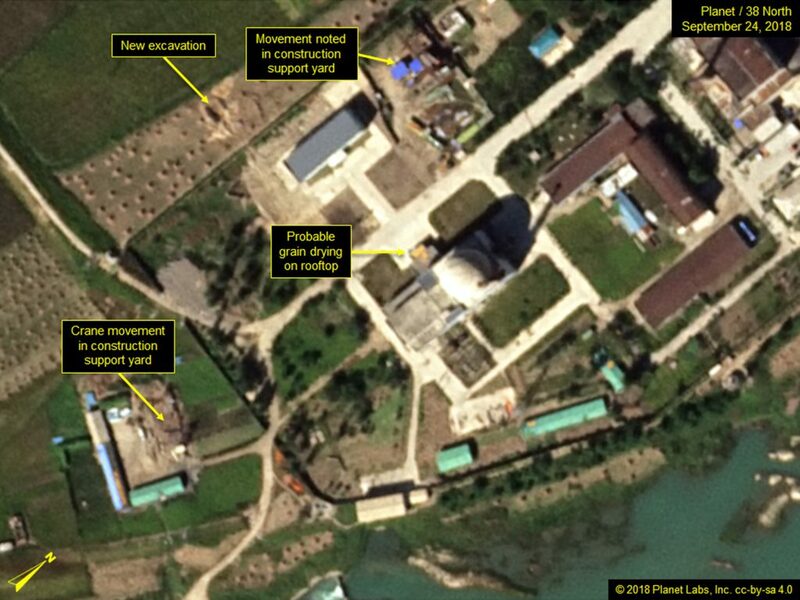 Some movement of vehicles, including some large trucks, were observed in the rear area of the 5 MWe reactor, but the purpose of this activity is unknown. Figure 1. Dredging continues adjacent to the new pump house. 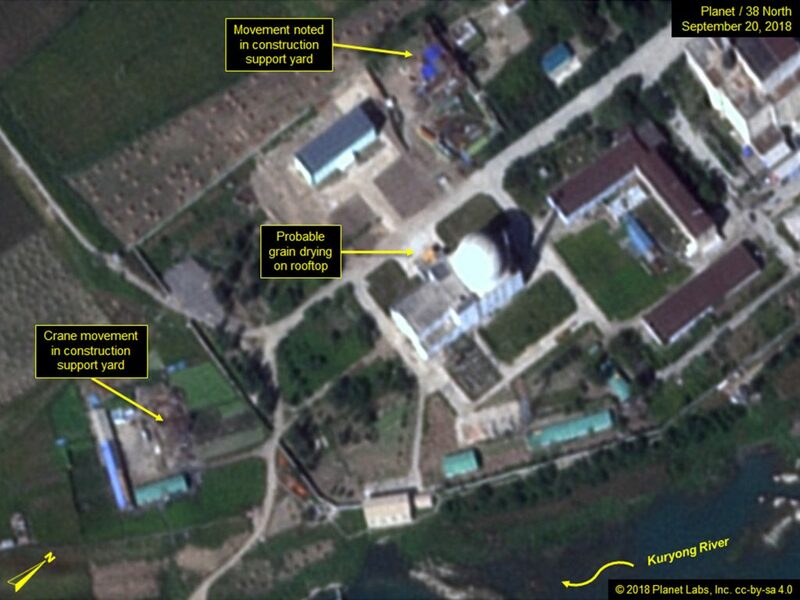 Some vehicle movement observed near the 5 MWe reactor. Image © 2018 Planet Labs, Inc. cc-by-sa 4.0. Some movement of cranes and equipment has been observed within the two Construction Support Yards of the ELWR. Within recent months, these yards have both been cleaned up substantially, which is consistent with completion of major construction associated with the ELWR. However, a new small excavation has appeared in a farm field just west of the new engineering office building; its purpose is unclear at this time. Figure 2. Movement of cranes and equipment observed at construction support yards. The Kuryong River reservoir dam continues to hold and to serve as a water height-limiting spillway. It has remained intact despite recent heavy rains, while the river flow seems to have ebbed substantially during the past month. Figure 3. The Kuryong River Reservoir dam remains intact despite recent heavy rains. 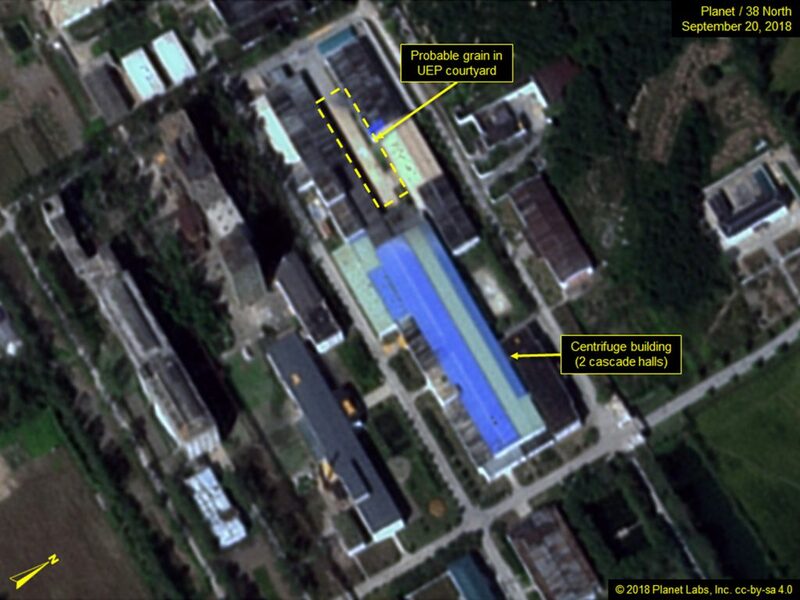 At the Radiochemical Laboratory (North Korea’s only known facility for separating plutonium), imagery from September shows less movement of vehicles than what was observed in our last report. However, some harvested grain (likely corn) can be seen drying on the on the roofs of a few of the buildings. Figure 4. A decrease in vehicle movements observed around the Radiochemical Laboratory. 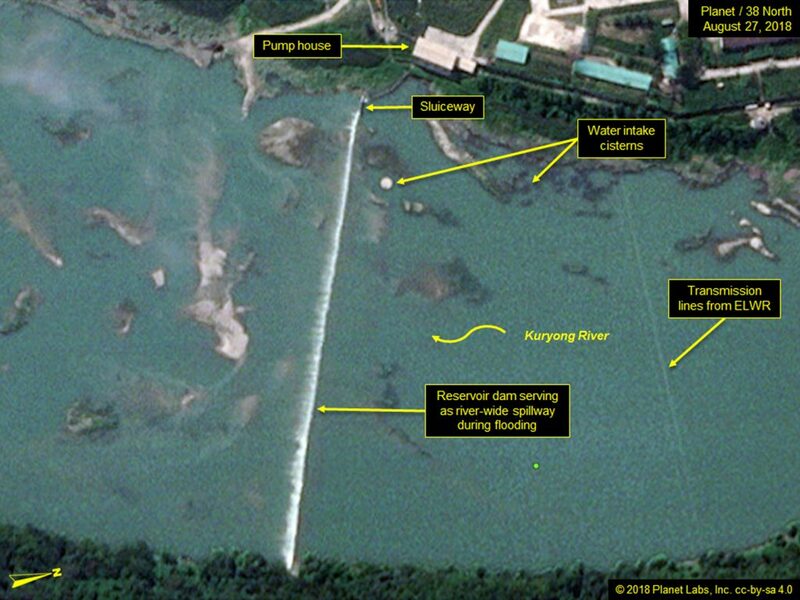 At the associated Thermal Plant, no new activity was visible. 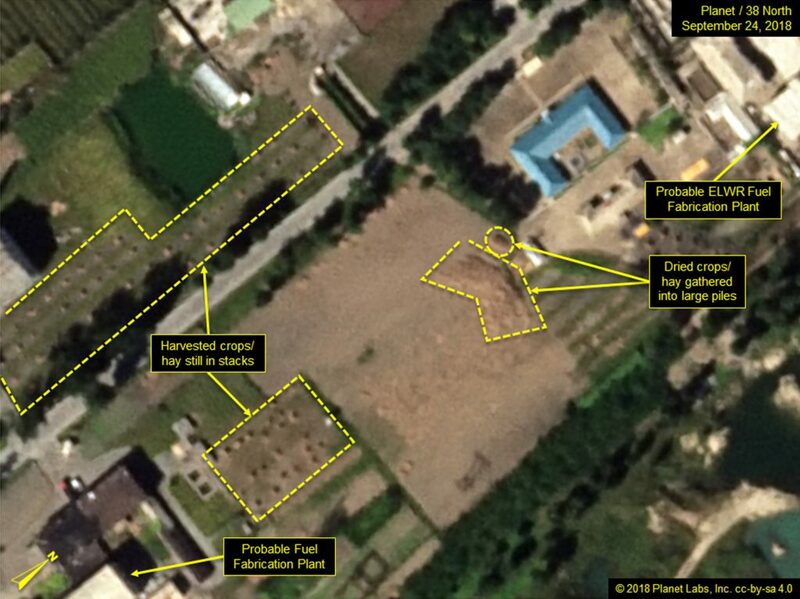 While no significant operational related activity could be observed at the Uranium Enrichment Plant (UEP), remnants of the previously reported piles of tan colored materials (most likely harvested grain) remained visible in the courtyard. Figure 5. Probable piles of harvested grain visible at the UEP. 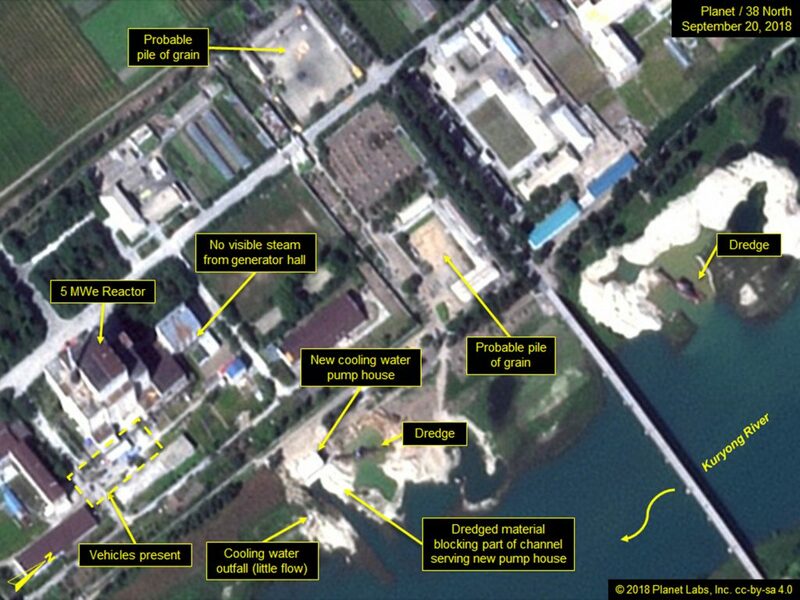 Located just north of the 5 MWe reactor and near to the main bridge that crosses the Kuryong River is the newer Fuel Fabrication Area. Large undeveloped land plots have been used for agricultural purposes and the harvest of stacked material is most obvious in both that area and around the nearby Research Laboratory Area as well. Figure 6. The aggregation of multiple small stacks of harvested crops or silage material (stalks of hay to be used later as animal feed) is clearly visible.